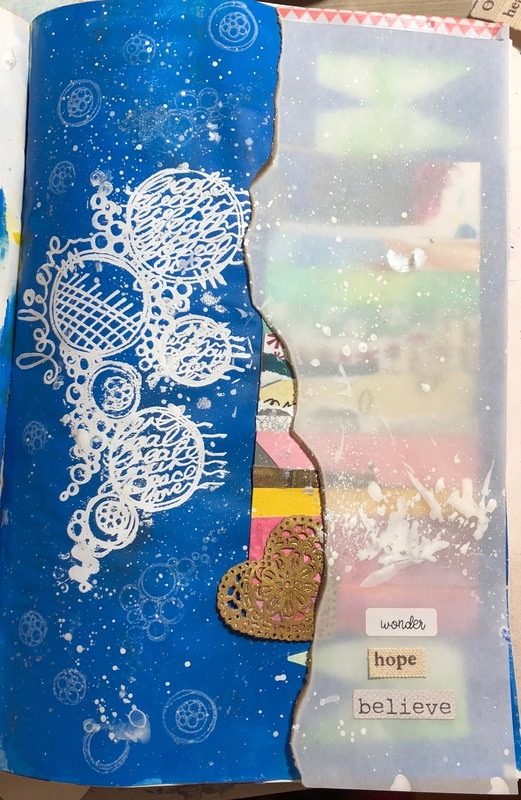 Paper Artsy has challenges all the time, but this one really caught my attention because I'd never burned anything in an art journal before so I just had to give that a try. To find out more click here. Do you ever feel like you don't know where to start when you journal? I do. Many times I just start. 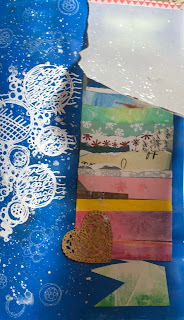 I paint, stencil, or play with scraps--I have either a scrap passion or obsession. This time I began sticking small scraps with matte gel on a bigger scrap. I decided to grab the first art journal my hand touched. (I'm currently working in four different ones) I pulled up a book that was discovered in the print shop. It's big and blue and filled with white paper. Flipping through it I found this blue page. I often wipe excess paint onto a blank page so as not to waste it and for interest on a future project. After I glued my scraps down, I wanted to tone the colors down a bit so I ripped a piece of vellum and burned it. That was exciting! The first time I blew the flame out on the paper, I blew out my match. I finally was able to manage both the paper that was on fire and the match. I taped down the paper with washi tape. I rubbed a Bo Bunny laser cut chipboard heart with some Nuvo Golden paste and tucked that right behind the piece of vellum so you could see it just peek out. 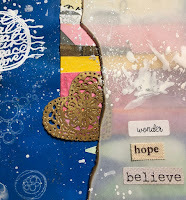 I added this really cool Paper Artsy stamp to my project by embossing with white embossing powder. The smaller stamps in the set I stamped with Distress Picket Fence ink for a lighter impression that faded into the back ground. 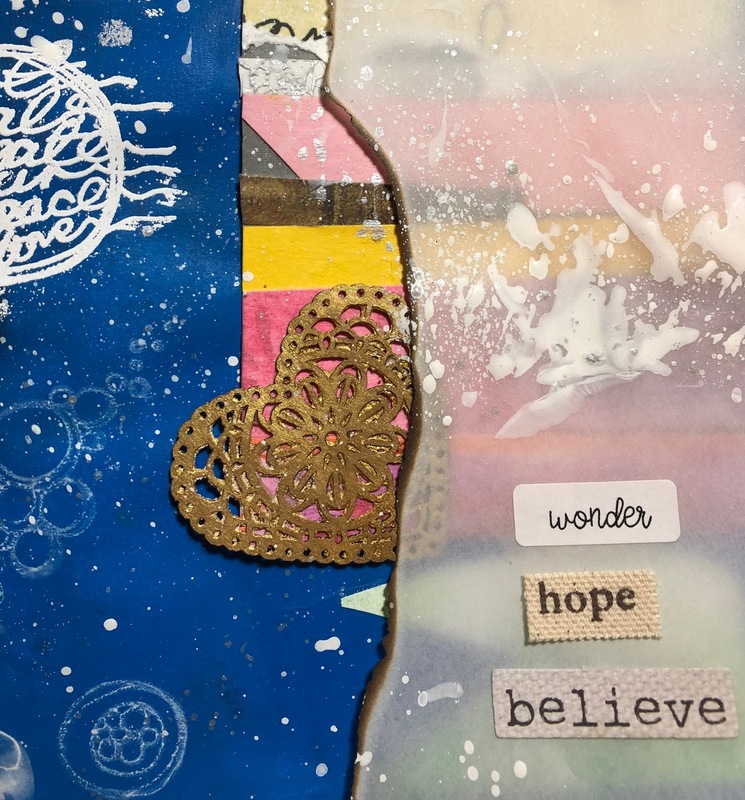 I chose words from my Paper Poetry stickers and a few leftover from mixed media kits that spoke to my about faith. Heavy splashes around the words and splatters over the page in watered down titanium white and silver paint pulled everything together. So my lesson learned from this project is to just begin when I'm not so sure where to start. Beginning is the first step to every art project. I challenge you to just begin. And then share. P.S. Do you want to peek at my Etsy shop? Click here. Materials; Most materials come from Pink Bunkadoo or Amazon where I get most of my craft supplies because I live in the sticks. Affilliate links cost you nothing. Thanks Wanda. I really appreciate your kind words. It’s fun. Do it over the sink with running water handy. I was nervous so that is what I did. Thanks for your kind comment.